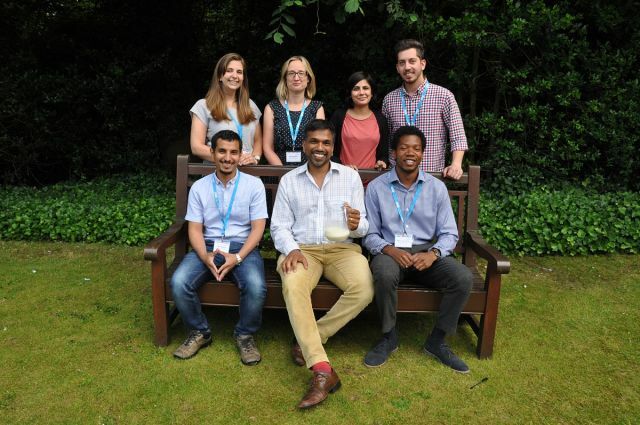 Between 12th-14th July I had the opportunity to attend the Eighth NIHR Doctoral Training Camp in Leeds. 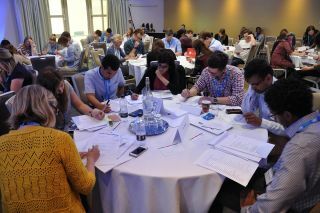 This three-day camp involved meeting and working with other trainees from Research Centres and Schools within the NIHR. I cannot thank the SPCR enough for giving me the opportunity to attend this event, and strongly recommend this camp to future trainees who are interested in going. It’s intense, it’s hard work, but it’s so rewarding and an experience I will never forget." The theme of the training camp was all about “The Art of Communication”. The overall goal was to put together a communications plan based on a published piece of research, and present it to the “NIHR Making People Healthier research program” (MPHrp), a fictional funding body. Image: Rachel (top left) and her group. The first day eased us into the theme of the camp, with brilliant talks from Dr Giles Yeo and Professor Anthony Redmond. Dr Yeo gave a thoroughly entertaining and powerful talk about the importance of conveying your research effectively, succinctly, but more importantly accurately. Professor Redmond added to this by talking about how we need to be able to describe our research in 20 words and ourselves in 10 seconds, taking into account our audience. Then the hard work began. We were split into our groups and were introduced to our mentor. I was in a group with delegates from a range of disciplines: a respiratory research nurse, a gastroenterologist, a radiologist, a health economist, and a medical physicist. We were then handed our research paper for our communications plan: iodine deficiency in the UK. This was an unfamiliar topic for all of us, so we had to establish what skills we had between us in order to understand the paper’s message and how we were going to put together a strong communications plan to the expert panel on the final day. Our team name was quickly decided: “Io-Team”. We hit the ground running on day 2, with a masterclass on writing and implementing a communications plan, and then we were sent to our individual team rooms to work on our plans. We had strict deadlines: to provide a lay summary of our research by 1pm, to have our plan submitted and signed off by 5pm, and our presentation slides completed by 5.30pm. We were encouraged to arrange meetings with PPI, press, and communications representatives, and the Deputy Director of MPHrp Science to discuss our communications plan, and to get advice on how to improve it. There were workshops on communications advice. We were also warned that there would be a few “surprises” during the day. I was nominated to act as the media spokesperson for our team, and my fun started as soon as we entered our team-room: we found a letter from the Director of the MPHrp requesting a press release of our research by 1pm. After lunch, there was a knock on our door and I was informed that I would be required to take part in a “live news” interview in 5 minutes. I certainly felt the pressure, but fortunately had been to a workshop that morning on “Top tips for media interviews”, so had a couple of tricks up my sleeve to handle the tricky questions I was asked while in front of the camera and having a microphone right in my face! Our team gelled together fantastically, and we put together a good communications plan. The pressure was really on within the last half hour before the submission deadline, and not helped by the fact that our initial submission was rejected as our printer did not work properly and had left a blank stripe down each page! The nerves really set in on the final morning, as we arrived for our pitches to the panel of experts. The presentation went well, and while we were given a real grilling by the panel, we had learned the skills to deal with their questions and managed to navigate our way through their queries and criticisms. Unfortunately, we did not win the imaginary grant to disseminate our findings, but we were proud to have put together such a good plan in such a short space of time. So what did I take out of this camp? Apart from the importance of drinking cow’s milk to reduce iodine deficiency, I learned about putting together effective communication plans, working in a multidisciplinary team, and delegating tasks to ensure timely completion of projects. More importantly, the camp gave me a real confidence boost – it made me realise how well I work with others, and that I have research and communication skills that contributed to the work we put together. I cannot thank the SPCR enough for giving me the opportunity to attend this event, and strongly recommend this camp enough to future trainees who are interested in going. It’s intense, it’s hard work, but it’s so rewarding and an experience I will never forget.